On August 30, I attended Fry Fest 2013, and for the first time, I had my own booth at Fry Fest! It was a terrific day…one I won’t forget for a long time. I have attended the past several Fry Fest events, but I have never had the opportunity to greet fans at my own booth. This year, I figured…why not? 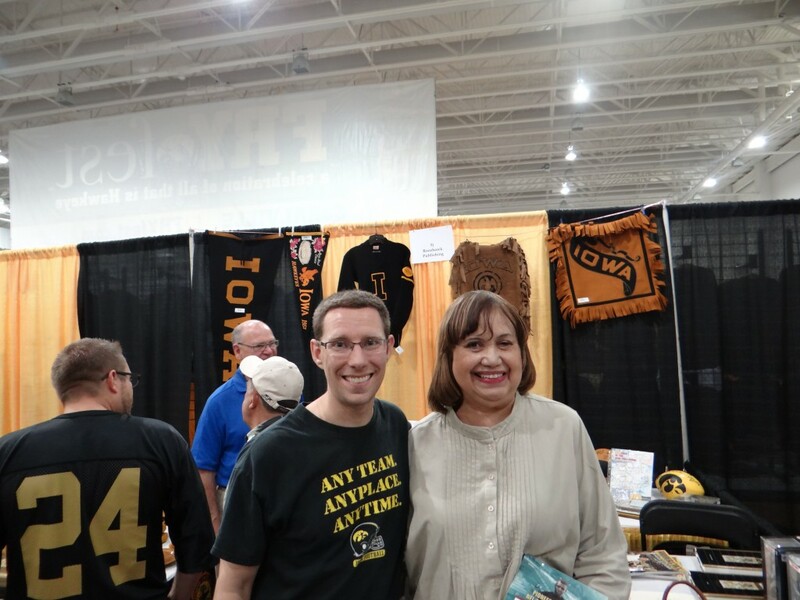 Fortunately, I was able to share the booth with my buddy Matt Fall from Iowa Gridiron Collectibles. Matt had all sorts of unique Hawkeye collectibles to show off for the fans, and he really helped spruce up our booth! 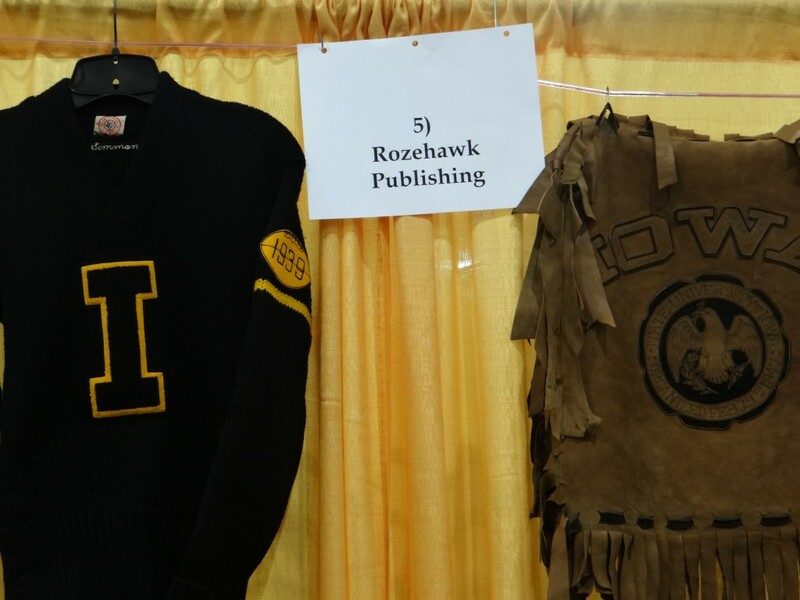 Matt and I arrived early and decorated our booth with Hawkeye memorabilia. Fry Fest 2013 turned into my first book signing in two years. 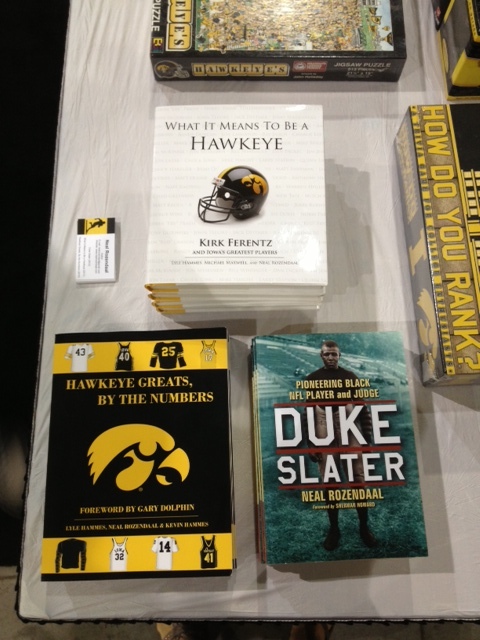 I had all three of my books available for fans to see, and I had a terrific time chatting up Hawk fans and talking about my writing. 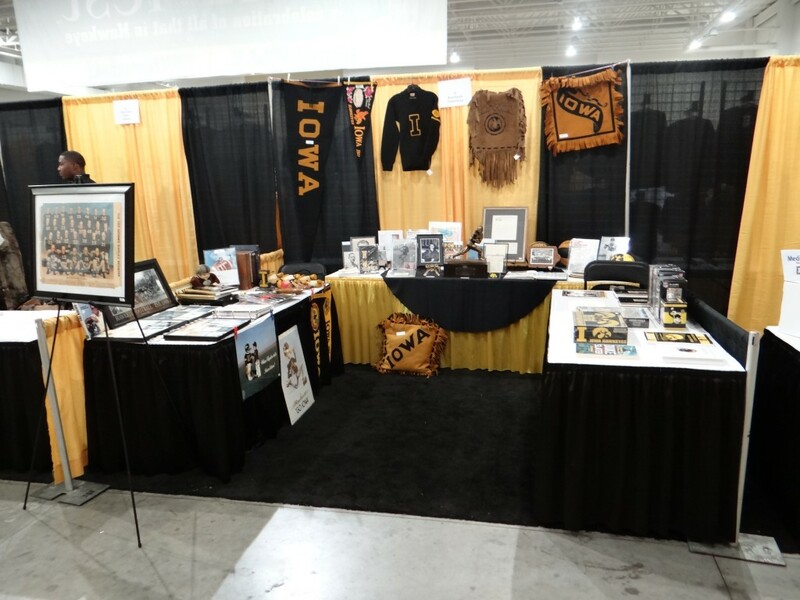 Our booth was located in the back of the convention center near the Hawkeye Tradeshow. 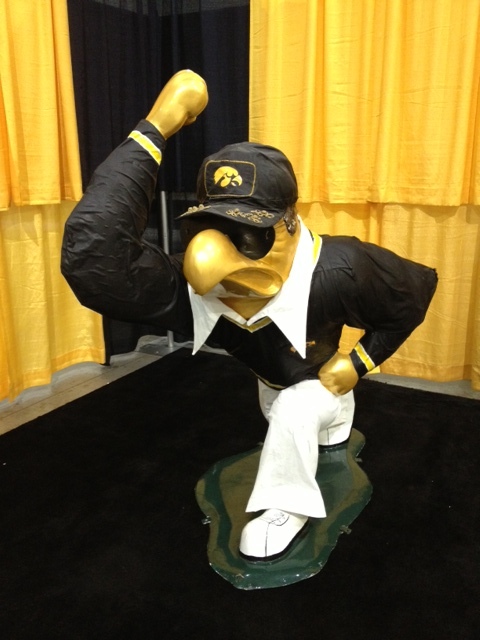 Our booth also got a lot of traffic thanks to the Hayden Herky that was right across the aisle! The big news of Fry Fest 2013 was that the university is bringing back Herky on Parade, ten years after littering the Iowa City area with creatively dressed Herkys. 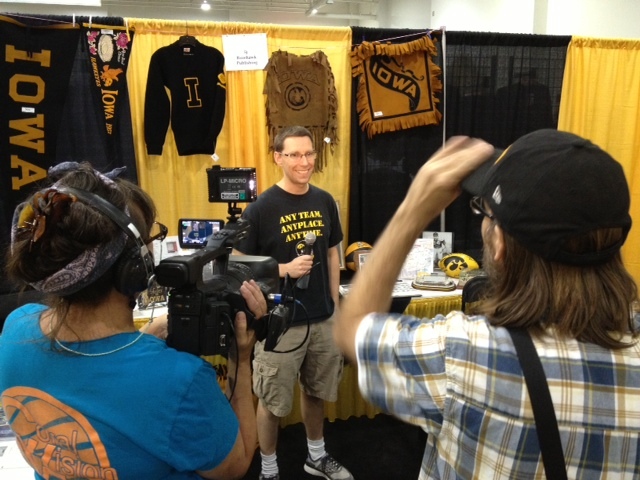 Around noon, a local public access television station stopped by to do a piece on some of the Fry Fest exhibitors. Being the attention-seeker I am, I took them up on an offer to do a television interview. It was a blast…I greatly enjoyed the chance to talk to the cameras, and I think I did a much better job than I did in my first television interview! The highlight of the afternoon was a visit from Sandra Hoskins Wilkins, the niece of one Duke Slater! Mrs. Wilkins and her husband Alonzo came all the way up from Georgia to take in Saturday’s festivities. I have talked with her on many occasions about my Justice for the Judge campaign, so it was wonderful to finally meet her in person! Just a great, great lady. The event Mrs. Wilkins was really in Iowa for, however, took place later that evening in Clinton. But more on that in my next post! I’ve been asked a few times since Fry Fest if I would get a booth again…and honestly, I’m unsure. While I had a great time, the big downside is that I feel like I missed the convention! Still, I very much enjoyed having the opportunity to meet and greet Iowa fans. It was a lot of fun, and one way or another, I can promise I’ll do everything I can to get back to Fry Fest again next year!